Overview: The US dollar is narrowly mixed against the major currencies, but the strongest currency today is the Chinese yuan, following reports that US wants China to keep the yuan stable and not offset US tariffs with currency depreciation. The second monthly decline in Japanese exports weighted on the yen. In the UK, another Labour MP left, while there is speculation that a few Conservatives may defect today. The focus in the US turns to the FOMC minutes from last month's meeting that saw a meaningful change in the central bank's rhetoric. The steep losses in the stock market and elevated volatility that spooked officials have been retracted by about 75% and the VIX is at four-month lows. The MSCI Asia Pacific Index has advanced for the third session and is at its highest level since October, still more than 1% below its 200-day moving average. The Dow Jones Stoxx 600 firm enough to reach a new high for the year and fractionally below its 200-day moving average. Benchmark bond yields are little changed. Gold is at a new 10-month highs and oil is trading slightly lower. The Chinese yuan has risen by about 0.6% today, which makes it the strongest currency today. It is the third day of gains. We had previously understood Chinese officials to indicate they did not want the dollar to trade below CNY6.70. However, this area may now be challenged. The ostensible trigger comes from reports that the US seeks a commitment by China to maintain a stable currency. 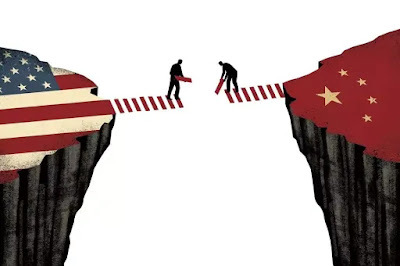 In the reports, the meaning of stability (real, nominal, basket, bilateral) is not clear, but the idea is that the US is trying to prevent China from offsetting tariffs with a weaker currency or seeking trade advantage from the exchange rate. Chinese officials have long said they desire a stable yuan and have pledged not to use the exchange rate as a trade weapon. Both sides are conflicted. The US has encouraged China to allow markets to determine exchange rates. If the market determined the yuan's value it would be more volatility and likely weaker. Chinese officials are engaged in various efforts to support the economy. A yuan that does not adjust creates other distortions.